Got this board in a lot of faulty boards in a trade. It came in an antistatic bag with a note written on it "will not boot". Upon first inspection I noticed board was very filthy so probably hadn't been stored in the bag all the time. Also custom chip UEC-52 was completely missing (ripped from the board). 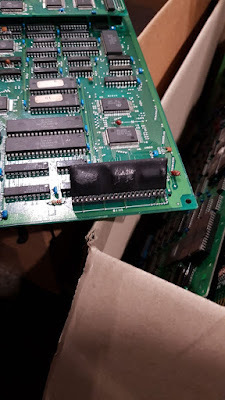 Fortunately Caius from jammarcade.net sells reproductions of it, only I placed an order for one few days ago for an other board which had the chip scratched to the point only legs of the SMD ICs mounted on it where left. At least I'll have the ICs reference from the reproduction. I usually find very few information about what a board should do with missing elements, which is a pity since this can be extremely useful for repairs. So as said game wasn't completely dead but played blind due to the missing custom chip. 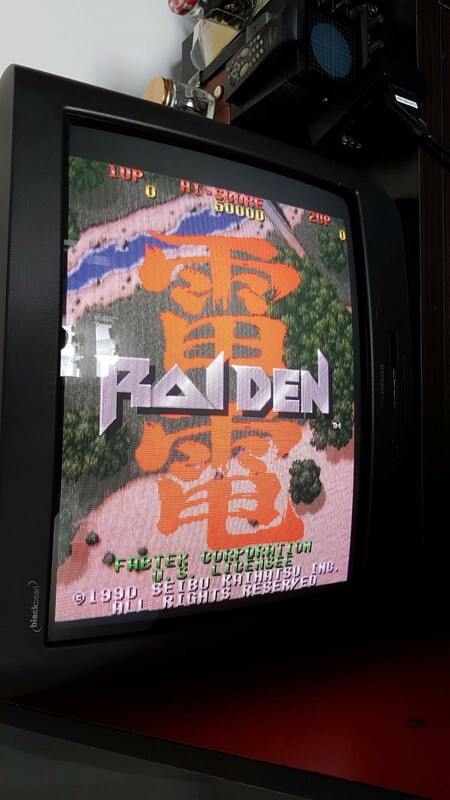 Fortunately I had received an other Raiden board few weeks ago which was perfectly working (and turned out to be an undumped set). Could it be as simple as installing back the custom chip to get a fully working game?